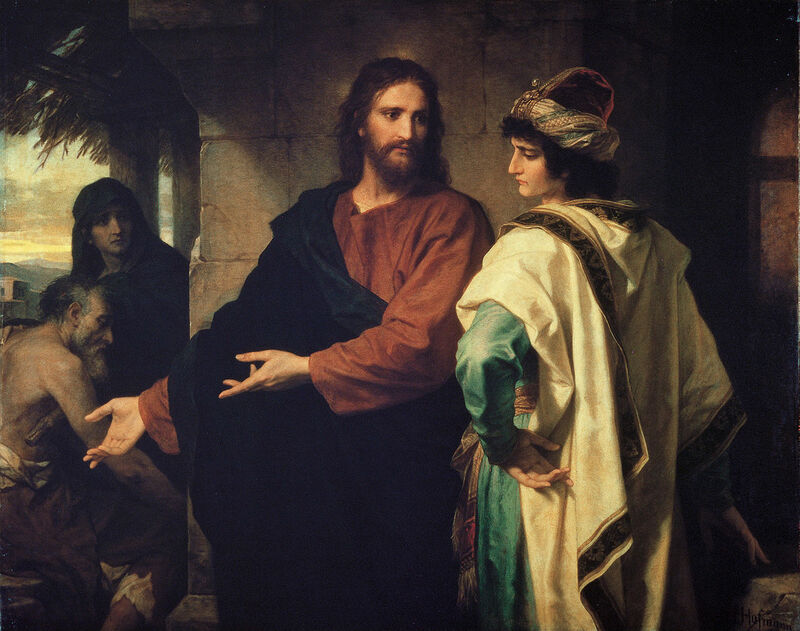 “Christ and the Rich Young Ruler” by Heinrich Hofmann, 1889. Some time ago I wrote a post entitled Faith and the American Dream. In it I shared some unsettling questions that I have begun to ask myself as I reflect upon my life to date. If you didn’t catch it you can find it here. I have continued to pursue this uncomfortable line of self-evaluation and, rather than reaching satisfactory conclusions, I am finding that the deeper one digs the more difficult the questions become. I am beginning to feel a bit like Alice tumbling down the rabbit hole. What is becoming apparent to me is that I need to re-define my understanding of what it means to be blessed by God. Now don’t misunderstand me. I am not attempting to downplay the role of God’s blessings on our lives. I will be the first to acknowledge that I am the beneficiary of immense blessings (as are you). But I have become all too aware that I have frequently been guilty of equating my level of “blessedness” with my level of material comfort. And I am doubtless not alone in this. I would argue that this is one of the more alarming developments in the contemporary American Church. How often have you heard this conversation, or one very like it, between two believers? I have said it countless times over the years. And I’ll bet that many of you have too. But is it true? I was recently re-reading the story of the Rich Young Ruler whose conversation with Jesus is recorded in Mark 10. You will recall that when he asked Jesus how he might inherit eternal life Jesus advised him to “sell all you possess…and come follow Me.” The young man walked away in disappointment. The Scripture tells us the reason why—“…for he had great possessions”. Later in the same story Jesus went on to make some startling statements to His disciples in verses 23-25. He is very clearly describing wealth as an impediment to eternal life. This does not seem to imply that material wealth is a blessing at all. In fact, He is saying quite the opposite. And lest we try to re-interpret His meaning as something other than what it appears on its face, He goes on. In the verses that follow (verses 29-30) He describes the blessings that accrue to those who are willing to walk away from material comforts and relationships for the sake of the Kingdom. He is extolling the virtues of “sacrificial living”. This is not our contemporary idea of wealth management. But surely this doesn’t imply that wealth is inherently bad does it? Of course not. Wealth is inanimate. It is neutral. And it certainly does not imply that people with wealth are inherently bad. But when evaluated in the context of Christ’s comments it cannot rightly be looked upon by the believer as a blessing. But if it is not a blessing, then what is it? A responsibility? Certainly. A stumbling block? Maybe. But a blessing? It’s a bit like you needing a ride to work and me giving you a very technologically advanced helicopter that you are not qualified to fly. Will it get you there? It can—if you study hard and learn how to fly it. But if you aren’t extremely focused and intentional in your preparation and how you use it, it is more likely to kill you—and maybe others as well. On the other hand, if you are careful in your training, conservative in your operation, and generous in its use, you may actually be able to meet your own needs and those of others as well. I realize that this flies in the face of what we in the American Church have practiced and aspired to. We speak about being generous with our time and resources but we see no inconsistency when we use our resources to create an opulent and comfortable lifestyle for ourselves—even utilizing significant amounts of debt to do so. Doesn’t this strike you as odd? It is certainly true that opulence and material comfort are relative concepts. And I am not suggesting that God is more pleased with someone who chooses to live in a cave than someone who lives in a nice house. But I am suggesting that we in the Church have had a tendency to spiritualize the materialism inherent in the American dream by re-defining it as a blessing from God. This has allowed us to re-classify our grasping upward mobility as a virtue. And this unbiblical view of material wealth has the further disadvantage of implying that those who have not achieved a demonstrably high standard of living have been somehow left out of God’s blessing. This is utter nonsense and should be banished from our way of thinking! There is much more that can be said on the topic and I continue to tumble deeper into the rabbit hole in my own life. I hope to be able to come to some practical applications that bring my personal consumption into closer alignment with Scripture. Until then let us pray for guidance as we seek a better way. Drop me a note in the comments section and let me know your thoughts on the subject. I would appreciate hearing from you. This entry was posted in Faith and tagged American Dream, Christianity, christians, Church, materialism, prosperity, wealth. Bookmark the permalink. Jim, I really enjoyed your last post which helped understand better that what we receive in this world is a “test” of our faithfulness to the One who is more then faithful. I believe that the story of “the YOUNG rich ruler” is not by chance called that. Young is a key word. For a young (immature) person, even as a believer, the riches of these world can be a very strong stumbling block. How did the young ruler become rich? That’s a different question that could help us understand his attitude towards priorities. Maybe he was to young to understand that life is more than that…. So glad to see someone challenging and examining these inconsistencies. Another one is the view that we are blessed because tragedy fell elsewhere. Does that mean the victims are cursed by God or God is disinterested in them? After reading your article, I really couldn’t stop thinking about it. I started to ask myself what a blessing really is. From one who was raised in an upper middle class family and grandparents who would have been considered wealthy, to total and complete loss of almost everything in my life, and now back to a life with more than I could have imagined, I have to stop and really consider what being blessed is. Am I blessed? Absolutely. Am I blessed as much as everyone else? Well, I suppose that answer depends on what evaluation you put on the word blessed. Material gain? Family? Health? Money…? When I speak of my own life of having, losing and gaining I am speaking from the view point of material wealth. I never lost what was truly important. But, isn’t that is how the world defines being blessed so much of the time? We are human and can be lead into believing that things, possessions, money, beauty, etc. are the “blessings” we should continually covet in our lives. Those people will tell you that the more of them you have the more you are blessed. There are people who have more mercy than I do, people who are better leaders and people who have more money than I do. Each of those people are given those gifts to use for others as my gift is for me to use. You see, I believe each Christian is blessed in ways that have nothing to do with the world we live in but in contrast, can be used for God because of the world we live in. Inside each of us rests the Kingdom of God and through us we are used by God to do His work. I believe being blessed is about recognizing those spiritual gifts we have been given to do that work and in turn, will bring us happiness. We must take into account that no one is blessed more than another. For in the Kingdom of God all gifts are necessary to bring about the work of the Lord. Each is necessary, whether it be money or something else. The feet need the legs, the legs need the arms, the arms need the hands, the hands need the head, etc. It is we as humans who in our sinful nature, chose to define and calorize blessings according to what the world deems important. Each blessing given and received should be given back to the world in ways that glorify God and lead to the fulfillment of the Great Commission. For it is only then that the blessing truly becomes a blessing. Regardless what my blessing from God is, as long as I am focused on using it for the Lord…I am blessed. Bingo, Louise! I think you are looking at this in the right way. Thank you for such a thoughtful response. It gives me much to think about as I continue down this path.